For those of you looking for tips for buying a home in NYC, welcome to the ultimate jungle of the 1%. Depending on what price range you’re looking for, you’ll be facing off against competition ranging from desperate working professional couples to wealthy cash buyers from China happy to leave their “store of value” completely vacant without any rental income. Competition for homes up to $2 million is known to be extremely fierce in NYC due to the large numbers of working professionals making $300,000 a year who can afford that price range. If possible, buy when the market is taking a breather and at a price range higher than $3 million. However, given that having unlimited cash and flexibility in timing is not a luxury for everyone, we’ll deconstruct every typical piece of advice you’ll find on the internet written by people who have never bought or sold an apartment. Competition for homes up to $2 million is known to be extremely fierce in New York City. Condo or Coop When Buying a Home in NYC? What Happens If I Reach out to a Listing Agent Directly in NYC? What Can Go Wrong If I Reach out to a Listing Agent Directly? Who’s the Correct Listing Agent for a Property? 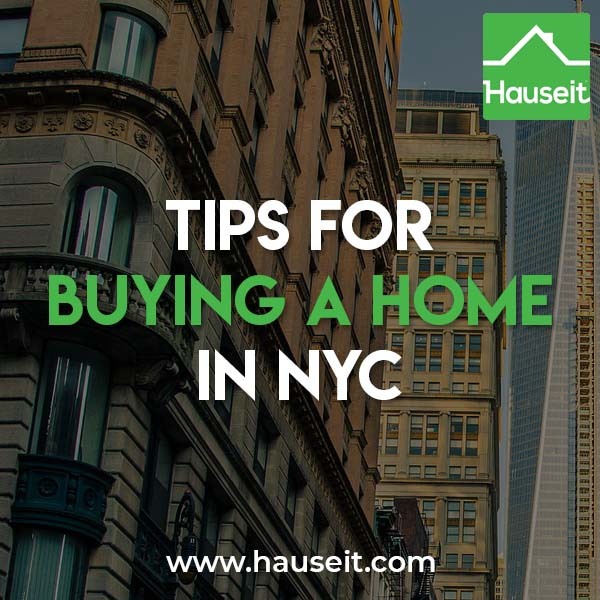 This is the typical first piece of advice you’ll find online for tips for buying a home in NYC. The typical article will suggest you work with someone you trust (who doesn’t have at least 5 real estate agent friends in NYC? ), ask friends and family for a referral or look online for public reviews of great buyers’ agents in your area. The primary flaw of this advice, much to the detriment of all home buyers, is that it doesn’t even present to first time home buyers the possibility that they can get a buyer agent commission rebate to help cover their closing costs in NYC. While frustratingly uncommon in NYC even after it’s been legalized in New York by the New York State Attorney General, it’s almost criminal that there are almost no news article in the first few pages of Google results on home buying that even mention the possibility of a commission rebate. The key for buyers to understand is that even though the services of buyers’ agents are pitched as being free, you along with every other buyer are paying for it collectively in the form of higher sale prices. Just because sellers have to pay the broker fee (which is typically split between the listing broker and buyer’s broker) does not mean they don’t markup sale prices to account for this cost. Given this clarification does it not make sense then to ask for a commission rebate to account for the higher purchase price you are paying? We suggest first deciding whether the average $20,000 off your purchase price in the form of a buyer agent rebate is worth it to you when buying a home in NYC. If it doesn’t and you just want to work with someone you already know and are comfortable with (Russian and Chinese overseas buyers we’re talking to you) and the money doesn’t matter, then congratulations and you probably don’t need to be spending time reading this in the first place. If however, you think that 1% off your purchase price (that’s over $20,000 on average in Manhattan where the average sale price is now $2 million) is worth it, you’ll want to know whether receiving one will affect your ability to close on a scarce piece of inventory. 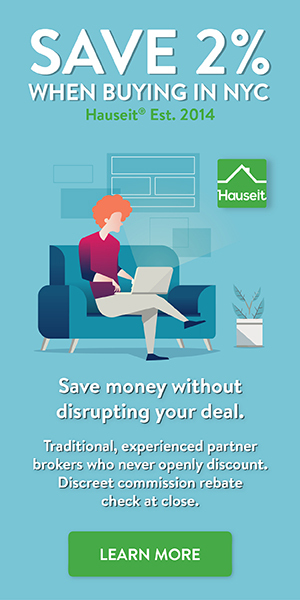 While there may be unprofessionalism and listing broker discrimination against the typical one man operation offering these types of rebates, there will not be any issues in working with a brand name, traditional brokerage affiliated with Hauseit. The key is to work with a well regarded, traditional real estate professional in your area who has full access to all listings and does not advertise him or herself as a discount broker in any way. You want the benefit of working with a full-service broker with a stellar reputation and also the benefit of a discreet commission rebate when buying a home in NYC. The typical piece of advice online will suggest you get “pre-approved” so that you have a sense of what you can actually borrow and afford to buy. What they won’t tell you is that the best brokers won’t work with you unless you can demonstrate that you are a real buyer. That means if you’re going to need financing, you have already been “pre-approved” by your mortgage broker or bank and have 25% down or more. A bank pre-approval letter is much stronger than a simple pre-qualification letter. The former means the bank has already partially underwritten your loan and typically means that you are already 80% of the way there. The latter is much easier to secure, typically as quickly as after a 15 minute phone call with a mortgage banker where no documents have been submitted or verified by the lender. As a result, if you’re going to need a mortgage, make sure you get pre-approved before you begin your search. This way, listing agents will taking your inquiries and offers much more seriously if you’re buying directly. And if you’re planning on working with a buyers’ agent, they will take you much more seriously as well if you’ve demonstrated your intent and ability to buy by already having a pre-approval letter. At this point, the typical article you’ll find on the web will give you a range of fluff ranging from “move fast” to “exceed the ask” to “establish a connection” and to “show kindness and flexibility” to the seller. While most of these may make sense (and some are just common sense) under certain conditions, they are all automatically addressed if you have a competent buyer’s broker. What’s more important is to clarify the advantages at this crucial stage of searching with an agent vs searching by yourself. What’s important to realize is that one of the primary advantages of working with a buyers’ agent is that they actually do have fresher and more accurate listing data than consumers have access to. A buyer will typically use a website like the New York Times or Zillow to search; however, these websites do not refresh their feeds continuously. In contrast, real estate agents in NYC are contractually obligated to update their listings immediately or face stiff penalties from the local real estate trade organization. An agent in NYC must update a listing’s status change within 24 hours or face fines that range from hundreds to thousands of dollars and suspension from their local inter-broker database. And because agents update their listing data directly to their local inter-broker database, which also happens to refresh almost instantaneously (we’ve heard 30 minutes or less), the data they have is by default always fresher and most up to date. At this point, you should have an idea of whether you want to buy a condo, co-op or townhouse in NYC. Generally, condominiums and townhouses are more popular but priced higher because they are “real property” with all the traditional rights of real estate ownership. However, buying a coop is a popular choice for many working families because they are generally cheaper than comparable condos. Co-operative apartments are really just shares in a corporation that actually owns the entire building. A co-operative owner receives a stock certificate and a proprietary lease with the right to occupy a certain unit in the building. Co-operative boards have much more power than condo boards as they are the Board of Directors of the corporation. Please be aware that owning stock in a co-op is considered personal property versus real property. Since it’s required to have a real estate attorney represent you in New York, make sure to ask them any questions you might have. They will handle the entire transaction after your broker has negotiated an accepted offer with the seller. Contrary to normal practice in other states, real estate brokers in NYC do not handle the purchase contract or any other legal forms or riders related to buying a home in NYC. Your real estate attorney will negotiate the purchase and sale contract and manage and represent you throughout the NYC closing process. Pro Tip: Beware of coops that try to dress themselves up as coops with condo like rules, or even actual condops. Typically, you’re just buying a coop. When you’re buying a condop, that typically means you’re in a coop that has commercial condo neighbors on the ground floor. Please study our guide on the differences between co ops vs condos to learn more! One of the most common first time home buyer mistakes is to submit an offer without having hired or even interviewed a real estate attorney. When they inevitably get an accepted offer, they end up having to scramble to find and enlist a real estate lawyer. This can result in several critical days of delays. Sometimes, the sellers and listing agents take this to mean that the buyer was only window shopping and not serious. Given that real estate offers are non-binding, this will almost certainly result in the listing agent continuing to show the property and flashing your offer to other buyers. Unlike many other states such as California where purchase contracts are really just standardized forms and real estate lawyers are not required for transactions, New York requires buyers and sellers to involve a lawyer in a real estate sale (Judiciary Law § 484). None but attorneys to practice in the state. No natural person shall ask or receive, directly or indirectly, compensation for appearing for a person other than himself as attorney in any court or before any magistrate, or for preparing deeds, mortgages, assignments, discharges, leases or any other instruments affecting real estate, wills, codicils, or any other instrument affecting the disposition of property after death, or decedents’ estates, or pleadings of any kind in any action brought before any court of record in this state, or make it a business to practice for another as an attorney in any court or before any magistrate unless he has been regularly admitted to practice, as an attorney or counselor, in the courts of record in the state. Lawyers are a critical part of your team when buying a home in NYC, along with your buyer’s agent and mortgage broker or bank. A real estate attorney will review and negotiate the complex purchase contract and any riders on your behalf. Your lawyer will schedule an appointment at the managing agent’s office to review the board minutes and any original documents that must be reviewed on site. Your lawyer will conduct legal and financial due diligence on your behalf by reviewing the building’s financial statements, original offering plan and other important co-op documents such as house rules, sublet policy, proprietary lease and bylaws. Your attorney will guide you through closing and make sure your mortgage commitment letter and other mortgage documents are in good order. Your lawyer will give you a good faith estimate of your exact closing costs, handle any escrows and make sure the lender’s fees are correct. Your lawyer will review the title report or coop lien search and help you resolve any issues such as existing liens on the property. Your lawyer will also prepare all of your closing documentation, calculate how much money is owed by whom and make sure that all payments are accurately made at closing. Assuming you’ve decided to work with a buyer’s agent, you’ve got to respect industry conventions for buying a home in NYC and not make the “substantive first contact” directly with the listing agent. Doing so may give cause for the listing agent to refuse to work with your buyer’s agent because you are arguably a direct buyer. We realize this can be tough sometimes as you are eager to buy, looking at homes yourself on the internet and want to have your questions answered immediately. However, resist the urge to hit “Contact Agent” on a listing and instead send a list of your questions and listings you want to see to your buyer’s agent. Your buyer agent will reach out, schedule showings, sign you up for open houses and get your questions answered. It may seem cumbersome to have to work through a middleman, but the upside is you’ll have a loyal, dedicated agent who does have better data than you do who will help you schedule, negotiate and be with you every step of the way when buying a home in NYC. Most real estate agents who are REBNY Members will behave professionally and realize that it sometimes happens that a buyer agent’s client will reach out to a listing agent directly. Most listing agents will not make a big deal out of it and will not have an issue with buyers going to open houses and even private showings alone. Why? Because it makes the lives of buyers’ agents easier and every listing agent will also be a buyer’s agent for another client. And because agents need to be able to work harmoniously with other agents to be able to close a deal, they typically behave professionally so they can get the same lenient treatment in return. There will of course always be examples of bad real estate agents causing trouble for buyers’ agents who don’t show up, but these are typically small minded people who don’t do a lot of business. Moreover, there is no specific REBNY rule that requires a buyer’s agent to accompany the buyer to a showing. Some new development “sponsor sales” may have a separate co-brokerage agreement specifying that the buyer’s agent must attend the showing, but even that is not often enforced in practice. This is an actual email exchange between a childish junior listing agent, our affiliate buyer’s agent and a buyer agent commission rebate customer who had reached out directly to schedule a private viewing. Here’s what happened even though she had copied her buyer’s agent on all emails. The “buyer” (Emmelien Brouwers) showed up to view the apartment, but was alone. Zac didn’t join her. I emailed both of them separately after the showing but never heard back. I assumed she was just looking and the broker didn’t want to waste his time seeing a bunch of random places with her because he knew she wasn’t serious. It can be tricky to navigate all of the ads you see these days on popular real estate search websites. Most of these search portals rely on advertising income from real estate agents who pay to be accidentally contacted on listings. In the quest for ever rising revenue, these real estate search sites have made it ever easier for buyers to accidentally click “contact agent” and get mislead into contacting a random agent who paid to advertise versus the listing’s agent. This will be a headache for you when buying a home in NYC as you will have yet another intermediary in between you and knowledge about the property you’re interested in. The advertising agent may take a while to respond because they themselves will have to find answers from the seller’s agent. And if the seller’s agent does not know he or she will have to ask the seller or the building’s managing agent. What a chain of middlemen! 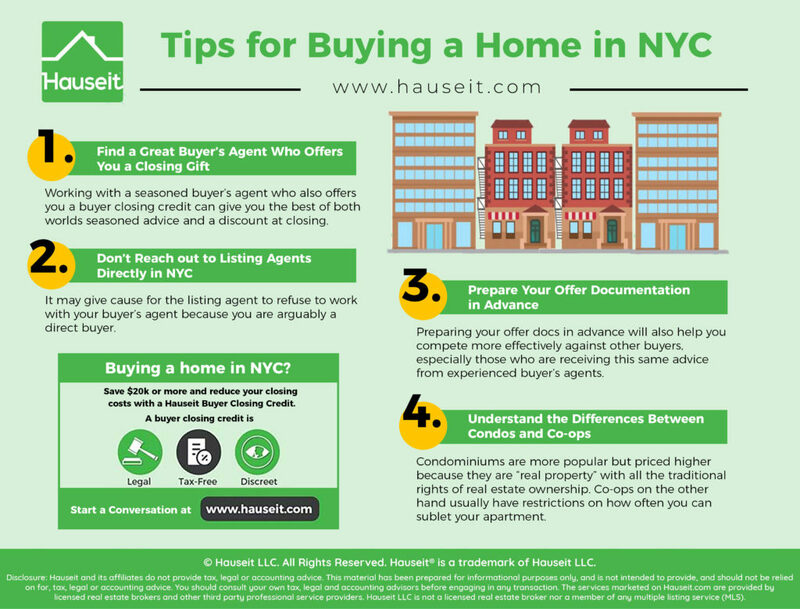 This is why it’s beneficial to work with a seasoned buyer’s agent when buying a home in NYC. Your buyer’s broker will always be able to contact listing agents directly, and can often find out more about the property before you can due to access to broker databases with more detailed property information. Better still, by working exclusively with a buyer’s agent, you will have only one point of contact for your entire property search. This beats getting added to newsletters and incessantly called and emailed by dozens of random advertising agents, listing agents etc. Perhaps you wish to save your buyer’s agent some time by finding out more information about properties directly from the listing agent. The best way to do this is to use a disposable email address or an alias. This way you can avoid harassment and not cause any conflict if you decide to make an offer on the property through your buyer’s agent. You can simply let your buyer’s agent use your real name then! Pro Tip: Look carefully before clicking any “contact agent” button when searching for properties online in order to buy an apartment in NYC. Search websites are still required to put who the listing agent is somewhere on the website, though that often means you’ll have to scroll to the very bottom. Some sites will still let you contact the seller’s agent, though you may have to take more steps in order to do so. You can always Google the address of the property to find another site that lets you contact the listing agent directly!